It’s been a week since my surgery. Everything went well. I’m doing great. Welp, see ya later. When they went in they noticed my thyroid Cytotec online was black. There were also bumps on the left side of my thyroid. At this point, they 86ed the whole “cut out half and see if it’s cancerous” plan and just took everything out. 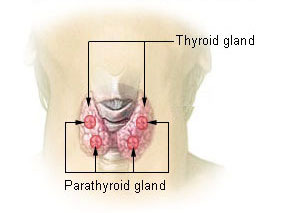 They also noticed a sneaky little parathyroid gland hanging out on my thyroid, so they peeled it away and hoped for the best (If you touch parathyroid glands, they stop working). And, as we all know, the parathyroid controls calcium. There were also some weirdi little lymph nodes, so they took those out, too. They were thinking the two lymph nodes might have just had some fat deposits but they wanted to be safe. And who needs two lymph nodes when you already have 80? Not I. As I was coming out of anesthesia, my doctor was kind enough to tell me everything that happened and I quote, “We did a complete thyroidectomy because it was black.” He may have said other things that I may or may not remember, but I got the gist. So who’s wondering about cancer? Well, it turns out the lump that was taking over half the right side of my thyroid was a follicular adenoma buy isotretinoin online , which is a benign tumor purchase orlistat . So great news! Since they took everything out when they were in there, I’m all done! No iodine drink! Nothing! Now who’s wondering why my thyroid was black? Well, they are thinking that the lump was preventing the blood from leaving my thyroid, so it was using the same blood over and over, therefore turning it black. At my post-op today, we found out that my parathyroid glands are working, so I don’t have to take calcium anymore. Which I am super happy about because they’re horse pills. My incision is also looking very good. They just ripped my little tape off, which may or may not have hurt … a lot. I should be able to move my head around like normal in about two weeks (My neck is all kinds of tight, so when I sing or yawn or talk I can feel every little thing going on in my throat. Weird. And don’t even think about sneezing after surgery on your neck. (Sorry for the parenthetical tangent)). So everything’s good! Now get ready for the corny. Thank you so much everyone for your prayers and fasting and thoughts. I can’t believe how amazingly supportive everyone has been. Thank you for sweet messages that made me laugh and cry. It really meant so much to me. I am so blessed to be surrounded by such amazing family and friends. Thank you.